Cheshire Raptor found the TP! My name is Angel, I spend most of my time in New Mexico USA, but like to zip down to Cuernavaca Morelos Mexico whenever possible. I am a CSA for Amazon Logistics who has a BA in Anthropology. The anthropology (and fantastic weather) is what has me popping down south every chance I get. I'm a big fan of the Cheshire Cat from Alice in Wonderland, velociraptors from the later part of the Cretaceous Period (and of Jurassic Park and World fame) and have the tendency to disappear from places for periods of time then suddenly pop back in and say hi. I had the nickname Cheshire Kitty all through high school (before it became an actual doll and a thing, should have slapped a TM on that when I had the chance!) because of that tendency and the fact I walk really quietly and scare people to death without meaning to. I have had many the threat of bells being applied to my person in some fashion for most of my life. I have been actively collecting for about six years, have but have not added a whole lot of ponies in the last couple of years. Just some finds here and there, some really good fakes and some I might not have thought about to begin with..but that's how the herd grows isn't it? I only collect G1, and G3 up to 2009 with the occasional odd ball thrown in. I had a Moondancer when I was young as well as a plush Firefly and one day six years ago, I was helping my mom clean out part of the attic and low and behold I stumbled upon my toy chest and guess who were sitting on top? Needless to say I dragged the chest down to the living room and spent the next couple of hours playing with my old toys. I never got any more ponies beside Moondancer and Firefly when I was young, but have quickly made up for it in the 300 plus ponies I have now; and that's actually not counting the original two! My mom still grumbles about me disappearing with my toy chest and I don't think that attic ever got the cleaning my mom wanted to give it. She is happy that I took my toys with me which my dad says was probably my mom's original plan. She's sneaky like that. 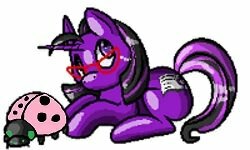 I look forward to seeing everything the Post has to offer and meeting other people who love these ponies as much as I and my cats do, my cats adore the G3's as if they were made with catnip! Not at all kidding, I have trouble keeping them in any place as once the cats find them they are scattered! Thankfully the cats mainly love them to death and toss them around by their manes and tails and leave no scratches or marks on them, although I collect for the sake of owning and playing with them not just for display or money value. Please feel free to hit me up and say hi or share stories, ideas, dreams...I'll be around. Welcome to the pack er um herd lol I love dinosaurs raptor the most. Welcome to the herd! What a delightful name. I, too,adore all things dino (even seriously considered paleontology as a career). How delightful that a bit of attic archeology reignited your passion for Ponies! What fun to find old friends and buy them all sortsa new Pony Pals. And yes, G3s are like Cat Crack. My cat Feisty Diablo especially just can't keep his paws off them. What a brat cat he is! Could we see piccies of your kitties? So glad you joined us here on the TP. I love the Cheshire cat as well. Ever come across any rare ponies in Mexico? I always think it would be so cool to find international ponies when traveling!